BACKGROUND: An allergic reaction to seafood and shellfish is one of the most frequent causes of food allergy. Allergy symptoms have been described by the ingestion of the following crustaceans: Lobster, large lobster, prawn, large prawn, spider crab, and crab. 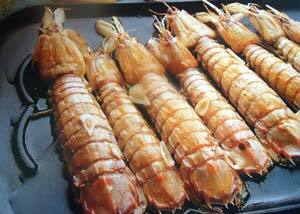 The Mantis Shrimp is a crustacean belonging to the Squilliade family. It has a fairly hard shell with the head attached to the thorax. Gastronomic wise you can prepare it boiled, cooked with other fish or fried in olive oil. CASE REPORT: A 25 year old female, with rhinitis due to allergy to Olive pollen, weed pollen and cat dander, consulted us after suffering twice from edema in lower lip, tongue and larynx, immediately after eating fried mantis shrimp four months ago. At a later date she suffered from the same symptoms after eating a crustacean pudding. Method and Results. SPT to inhalants: olive pollen, weed pollens and cat dander: positive. SPT to commercial foods (shelfish included): negative. Prick-Prick: lobster, large lobster, pranw, large pranw, Diblin bay prawn, spider crab and mantis shirmp: positive. SDS-PAGE Immunoblottingresults revealed IgE-binding bands of the following molecular mass: mantis shrimp shell: 46kDa (without 2-mercaptoethanol), small crab: 21 kDa (with 2-mercaptoethanol). Cross -reactivity studies by EAST- Inhibition and Immunoblottin inhibition methods showed the exisrtence of significant cross reactivity between the Ige-bonding proteins present inmatis shrimp and those from prawn and small crab.